One of India's most revered spiritual leaders, Sri Satya Sai Baba, has died in hospital. Sathya Sai Baba, whose message of universal love and brotherhood attracted millions of followers across the globe, was on Wednesday interred at the very spot from where he used to meet and address his disciples for years. The mortal remains of the 85-year-old spiritual leader, whose clout spread far and wide among both the commoners and the high mighty, were buried after the last rites were performed by his nephew R.J. Ratnakar in accordance with vedic customs following full police honours. Watched by a galaxy of political personalities including Andhra Pradesh and Karnataka Chief Ministers N. Kiran Kumar Reddy and B.S. Yeddyurappa, Governors E.S.L. Narasimhan and Shivraj V. Patil, BJP leaders L.K. Advani, M.Venkiah Naidu, Bandaru Dattatreya, former Telugu Desam leader and former AP Chief Minister N. Chandrababu Naidu, former Maharashtra Chief Minister Ashok Chavan and hundreds of his followers, Sai Baba’s body was buried amidst chanting of “sai” mantras. Once the last rites were performed by vedic pandits, red curtains were drawn around 9:45 a.m. and the process started for laying the body in a pit created at the spot in Sai Kulwant where the spiritual leader used to make his preaching for his followers for a number of years. It lasted about 25 minutes. The spot where he was buried is now expected to become an eternal memorial for Sai Baba, who at the age of 14 announced himself as a reincarnation of Shirdi Sai Baba. He made his mark initially with miracles but later founded institutions of excellence in education and medical facilities besides undertaking development work and philanthropy. Sai Baba died on Sunday morning after fighting illness for nearly a month caused by multi—organ failure. Prime Minister Manmohan Singh, Congress President Sonia Gandhi, political leaders from various parties, Chief Ministers and personalities from various fields including cricket and films had visited Puttaparthi in the last two days to pay their homage. An estimated five lakh people from various parts of the country and abroad had filed past the body to have a final glimpse of their spiritual guru. The curtains were removed after 40 minutes for the people to have a glimpse of the ‘samadhi’ where the body was laid to rest in line with the practice adopted for Hindu spirital leaders. Normally, Hindus cremate their bodies. With Sai Baba’s body draped in his favourite saffron robe, the last rites were performed by Mr. Ratnakar, who wept inconsolably, while priests recited vedic chants. Mr. Ratnakar is a member of the powerful Sathya Sai Central Trust, estimated to be possession of wealth to the tune of Rs.40,000 crore, and is believed to be a contender in the race to head the trust. Water from sacred rivers from all over the country were sprinkled on Sai Baba’s body along with cow urine. Cow, honey, ghee and silk were given as gifts to priests. After the ceremony was over, people gathered at the hall rushed to have a look at the samadhi, which was open for public viewing after 11.45 a.m.
Puttaparthi: Prime Minister Manmohan Singh and UPA Chairperson Sonia Gandhi today paid homage to Godman Sathya Sai Baba. Both the leaders stood in silence in front of the glass casket containing the body of the spiritual leader, who died on Sunday, and placed wreaths at his feet and sat for a few minutes at the Sai Kulwant Hall. They heard in rapt attention Sai bhajans being sung by followers before they left the hall. Singh and Gandhi, accompanied by Union Minister Ambika Soni, arrived here by a special aircraft and drove straight to Prashanthi Nilayam, where Baba's body was lying in state in the Sai Kulwant hall. Earlier, Andhra Pradesh Governor E S L Narasimhan, Chief Minister N Kiran Kumar Reddy, who reached Puttaparthi in the afternoon, received Singh and Gandhi at the airport and accompanied them to Sai Kulwant hall. Sai Baba would be buried in the Sai Kulwant hall with full state honours between 9 and 9.30 am tomorrow. The Governor and Chief Minister will stay in Puttaparthi and attend the burial ceremony, officials said. Puttaparthi (AP): With devotees continuing to surge into the town to offer their homage to the late Sathya Sai Baba, authorities on Tuesday extended the final darshan timing till midnight. Three special trains from Secunderabad, Visakhapatnam and Vijayawada brought in a large number of devotees to the town on the final day of darshan. "Devotees are standing in queue of about 1.5 km and their arrival is on the rise. We are trying to ensure that all devotees have an opportunity to have final glimpse of Sai Baba," who passed away on Sunday after battling multi-organ failure, he said. "We have spoken to Sai Trust authorities with regards to the extension of darshan timings from 6.00 pm till midnight and they have agreed for the same," he said. Prime Minister Manmohan Singh and UPA chairperson Sonia Gandhi and External Affairs Minister SM Krishna are among the VVIPs who are expected to visit the town this evening to offer their tributes to Sai Baba. Sai Baba would be buried in the Sai Kulwanth Hall here with full state honours between 9.00 and 9.30 am tomorrow. Followers including celebrities flock to bid farewell to Sai Baba, forming long queues outside his Puttaparthi ashram. Thousands of grieving devotees, including cricket star Sachin Tendulkar, have been filing past the body of Sathya Sai Baba, a popular Indian guru who attracted a worldwide following. Sai Baba's corpse was displayed in a transparent casket on Monday at his ashram in Puttaparthi, a village in southeast India that was transformed into a major pilgrimage centre during his life. Followers wept as they bid farewell to their spiritual leader, who died aged 84 of multiple organ failure on Sunday morning after spending three weeks in hospital. Locals and visitors, who had descended on Puttaparthi to pray for Sai Baba's recovery, formed long queues outside the ashram, waiting hours in the heat for the chance to see him one last time. Police reinforcements from across Andhra Pradesh state were on duty and crowd barriers were erected to control mourners frustrated that dignitaries were ushered ahead to view the body. "Many VIPs are allowed to see our god quickly without standing in line, while we have to wait hours to enter the hall," complained Ramesh Kumar, 38, a teacher from Chennai. Sai Baba was credited by millions of followers across the globe with supernatural powers, including the ability to conjure objects out of thin air, remember past lives and cure terminal diseases. Instantly recognisable for his wild curly hair and saffron robes, he was followed by Indian politicians, judges, Bollywood actors and sports stars as well as legions of the poor. Former national cricket captain Sunil Gavaskar was among those who rushed to Puttaparthi to pay homage. "He's left his physical form but we all know that he's going to live in our hearts," Gavaskar told the Star News television channel. "He will continue to guide and inspire us." Tendulkar, who flew in after a cricket match on Sunday evening, sat quietly by the body for a few moments with his wife Anjali, wiping tears from his eyes as scented sticks and musical chanting filled the air. Veteran actor Amitabh Bachchan led Bollywood's tributes, calling Sai Baba "a saint, a generous soul, a builder of society". Sai Baba's organisation funds health and education projects in India, including hospitals and clinics that say they cure ailments beyond the capabilities of mainstream medicine. From his ashram, he established schools and centres that spread his influence internationally, attracting supporters in the West such as Hollywood actress Goldie Hawn. Indian prime minister Manmohan Singh on Sunday said Sai Baba "was an inspiration to people of all faiths", but others saw him as a charismatic charlatan. His capacity to miraculously produce gold coins and watches at public meetings was often dismissed as a basic magic trick - criticism that did nothing to dent his popularity. He also faced allegations of sexual abuse of young male followers, which his opponents said were ignored by Indian authorities too fearful to investigate him. His body will be buried on Wednesday, in accordance with the common practice for spiritual leaders in India but contrary to the regular Hindu custom of cremation. India's Economic Times reported that Sri Lankan Airlines , the country's national carrier, will fly additional flights to India for the devotees who want to pay their last respects to Sai Baba. "The airline will have additional capacity on their daily flights to Bangalore from April 26 onwards in order to accommodate all devotees who wish to pay final homage to their spiritual leader," a spokesman of the airline said on Monday. Besides, the airline will also provide special charter flights, he said. With Sei Baba leaving no named successor to run his Sri Sathya Sai Central Trust (SSSCT), worth an estimated $9bn, some observers now predict a power struggle among his closest aides. According to Indian television channel NDTV, K. Chakravarthi, the trust's secretary, is one of the key people expected to decide on the coming events at Puttaparthi. Chakravarthi is the only trust member with cheque-signing power. Another important player is likely to be Satyajit, Baba's personal caregiver, who though not a member of the trust was very close to the guru. Last year, Baba is believed to have suggested that Satyajit should become a member of the trust. Puttaparthi, Andhra Pradesh, Apr 25 : Prime Minister Manmohan Singh and UPA Chairperson Sonia Gandhi would arrive here tomorrow to pay their last respects to spiritual guru Satya Sai Baba whose mortal remains were kept in the Sai Kulwant Hall in the Prashanthi Nilayam. Informing this to reporters here this afternoon, Andhra Pradesh Revenue Minister N Raghuveera Reddy said the Special Protection Group and the police department would make all security arrangements for the VVIPs visit who will arrive Puttaparthi at 1630 hrs. Mr Reddy said the Satya Sai Trust had decided to allow VIPs and devotees for their last glimpse of Baba till 1800 hrs tomorrow evening. All arrangements for the funeral of spiritual guru in the Kulwant Hall on Wednesday was completed, he said. He said so far one lakh devotees had paid their last respects to Sai Baba and the entire district administration was involved to ensure that the darshan of Baba passed off peacefully. The Minister appealed to the hundreds of devotees who were in queues to move fast as the crowds were swelling hour to hour. "If necessary we would take steps to arrange more queue for men and women separately," the Minister said. Mumbai, Apr 24 (PTI) A string of Bollywood personalities have expressed grief over the death of Satya Sai Baba who breathed his last today morning following prolonged illness. "Sad to hear about the demise of Sathya Sai Baba. He was an inspiration for many. Such an enlightened soul. R.I.P," wrote filmmaker Madhur Bhandarkar on the micro-blogging website Twitter. Condoling the death of the spiritual leader, actor Riteish Deshmukh said, "The man (Satya Sai Baba) spread love and helped the needy. Had the privilege to meet him and spending time with him. His invaluable guidance will be cherished for a life time. We love you and miss you baba." "Sri Sathya Sai Baba left his human body and departed away this morning. The body is merely a vehicle. His spirit will continue to guide us as always," actor Vivek Oberoi posted on twitter. "Just heard that Baba left his body and am sure is on his way to lots of temples, my heart bleeds for his followers, my sincere condolences," filmmaker Ram Gopal Varma tweeted. Actor Rana Daggubati said, "RIP Sathya Sai Baba. My condolences to all his followers. "Sathya Sai Baba had millions of followers all over the world. Their faith in him held them together. May God give them strength. RIP Baba," veteran actor Anupam Kher said. "Sai Baba RIP. My condolences to all his followers," tweeted actor R Madhavan. Director and writer Sangeeth Sivan said "R.I.P. Satya Sai Baba. Condolences to all his followers, disciples and loved ones". New Delhi, April 24 (IANS) Prime Minister Manmohan Singh Sunday condoled the death of Sathya Sai Baba, saying he was an inspiration to people of all faiths. Vice President Hamid Ansari and Bharatiya Janata Party (BJP) leader L.K. Advani also expressed sorrow at the passing away of the spiritual guru. Manmohan Singh said Sai Baba's death was an irreparable loss to all and the nation deeply mourns his passing away. 'I express my sincere condolences to the millions of his followers, disciples and well wishers,' he said in his condolence message. Sathya Sai Baba, one of India's most famous spiritual leaders with thousands of followers in the country and abroad, died at Puttaparthi in Andhra Pradesh Sunday morning after a prolonged illness. He was 85. The prime minister noted that Baba was a spiritual leader who inspired millions to lead a moral and meaningful life even as they followed the religion of their choice. 'His teachings were rooted in the universal ideals of truth, right conduct, peace, love and non-violence,' Singh added. 'He endeared himself to the people through various institutions, with headquarters at Prashanti Nilayam, that promoted egalitarian values, education and public health. He believed that it is the duty of every person to ensure that all people have access to the basic requirements for sustenance of life. Sathya Sai Baba was an inspiration to people of all faiths,' Singh added. Vice-President Ansari, expressing his 'deep sorrow' at Sai Baba's death, said his message of service to humanity as service to god and as a means of destroying narrow-mindedness is of eternal relevance. Advani and Punjab Governor Shivraj Patil, both ardent followers of Sathya Sai Baba, also conveyed their condolences. Senior BJP leader L.K. Advani said, 'I offer a tearful homage to his great soul. I would like to go for the anthyesthi kriya (last rites). I first came in contact with him only after my incarceration during 1975-77 emergency in Bangalore jail. And after that I have been meeting him quite frequently...and it has always been inspirational for me to meet him to get his guidance,' Advani said. 'On the one hand we may be feeling that we may not see him in his physical form and yet if we really understand what he taught us, Baba would always be there,' Patil added. 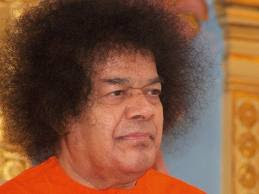 Andhra Pradesh government today declared a four-day State Mourning for Sri Sathya Sai Baba, who died in Puttaparthi in Ananthapur district today. The last rites of the Sai Baba will be performed with state honours, a state government release said. Baba will be buried at the Sai Kulwant Hall in Prashanti Nilayam on Wednesday morning. A government release said a State Mourning till Wednesday has been announced as a tribute to the departed dignitary. "The chief minister has also announced that the last rites will be performed with State Honours. He also declared Wednesday a holiday for Anantapur District," the release said. Chief minister N Kiran Kumar Reddy expressed grief over the demise of Sai Baba and recalled the "unparalleled services rendered by him to the humanity in myriad ways which are beyond description." "Sri Sai Baba is a symbol of love, affection and passion. Sri Satya Sai Baba has given his great self to service of humanity in the form of various services not only to our State, our country but also to the entire world," he said in his condolence message. "He will be remembered for ages to come by all sections of people all over the world," the Chief Minister added. A spiritual leader Sai baba stopped responding to the treatment and has reportedly passed away. After a prolonged battle with several ailments, Sai Baba passed away at Puttaparthi at 7.45 am on Sunday. An official announcement is shortly expected. Devotees of Satya Sai Baba burst into tears after his death was announced in the village of Puttaparthi, some 200kms north of Bangalore on April 24, 2011. Indian spiritual leader Sai Baba, one of the country's most famous gurus, died in hospital on April 24, 2011, television channels reported. He passed away at the age of 85 due to cardio-respiratory failure after spending more than three weeks in critical condition, the NDTV news channel quoted doctors as saying. Bhagawan Sri Satya Sai Baba of Puttaparthy passes away at SIMS in Puttaparthy. He is died of multi-organ failure. He was admitted to hospital with Pneumonia on March 28, 2011. Then irregular heart beat, acute renal failure and jaundice further complicated his health condition. He passed away at Satya Sai Institute of Medical Sciences which he built in 1991. Today is also the birthday of his devotee Sachin Tendulkar. Puttaparthi: Spiritual leader Sri Sathya Sai Baba died at the Sathya Sai super speciality hospital at Puttaparthi in Andhra Pradesh's Anantapur district today. The 84-year-old was admitted to hospital on March 28 with breathing and heart problems. Early on Thursday morning, doctors had said his condition was very critical and most of his organs were not responding to treatment. The condition of his liver and his low blood pressure were causing concern, they had said. Godman to some, miracle-man to others and revered as God by lakhs of his followers, Sathya Sai Baba had the rich, famous and powerful from the world of politics, business, films and sport flocking to his doorstep in Puttaparthi, the small Andhra Pradesh village that he made internationally famous. Born on 23 November 1926 in a modest family in Puttaparthi, Satyanarayana Raju declared himself a reincarnation of Shirdi Sai Baba at the age of 14. From then on his devotees and admirers only grew in numbers over the years. Though a few controversies did cast shadows on Sai Baba's image and critics have been skeptical about claims that he would produce holy ash, golden rings and mementoes from thin air, Sathya Sai Baba also earned respect for setting up world-class educational and health institutions and also for charitable work like drinking water projects for four semi-arid districts of Andhra Pradesh and in Chennai. The institutions and properties that he built are estimated to be worth over Rs. 27,000 crore. After a hip fracture in 2006, Sathya Sai Baba was confined to a wheel chair and gave darshan from his car or a portable chair. Sathya Sai Baba is dead. Local TVs has declared that at ‘Shri Sathya Sai Institute of Higher Sciences’ Sathya Sai Baba is No More in this World. Baba was 86 year old. All devotees of Baba around the world were worried about Sai Baba’s health since one month, when he admitted hospital following problems related heart and respiration. And today devotees get huge shock to listen news that they will not get Baba’s ‘Ashirvaad’ more. Sathya Sai Baba hospitalized on March, 28 due to heart and liver problems. Baba’s vital organs were not responding to treatment and doctors were making last-ditch efforts to save him, but they failed. Sathya Sai Baba was a spiritual teacher and miracle worker. And also he was a Godman for his devotees. Puttaparthi (Anantapur district): Medical specialists will be flown in from Bangalore and Hyderabad to treat Sri Sathya Sai Baba, who is battling for his life at the Sri Sathya Sai Institute of Higher Medical Sciences here. As in the past two days, his condition remains very critical. The decision to involve more specialists was taken at a meeting of the coordination committee in view of the 84-year-old Sai Baba's fluctuating healthcondition. It was attended by members of Sri Sathya Sai Seva Central Trust, medical specialists, Andhra Pradesh Minister for Major Industries J. Geetha Reddy and Anantapur Collector B. Janardhan Reddy. “Sai Baba is in a very critical condition due to abnormal liver functioning. His respiratory system has been put on the ventilator while he is undergoing dialysis to help in functioning of kidneys. All vital organs are not reacting to the treatment because of infection,” Dr. Janardhan Reddy told The Hindu after the meeting. The only positive sign was stability in heartbeat and blood pressure, he said. A bulletin released by Institute Director A.N. Safaya said Sai Baba continued to be in a very critical condition and that the episodes of low blood pressure were a cause of great worry. Telugu Desam Party MLA from Puttaparthi Palle Raghunath Reddy appealed to the trustees to clear all “misgivings” about Sai Baba's health by addressing the media. Puttaparthi (AP) The condition of Sri Sathya Sai Baba continues to remain very critical and his vital organs are showing minimal response to treatment, a senior doctor attending on him said today. "Sai Baba's condition is very critical. He is in the ICU and undergoing treatment as he is suffering from multi-organ dysfunction," Dr Ravi Raj, Director of AP Medical Education, told reporters here. "His heart is very weak. Blood pressure is usually low but is maintained at near normal level through medicines. His liver function is very poor and kidneys are not functioning. So he has to undergo dialysis," the doctor said. He said Sai Baba's intestines are also not functioning properly and he is being fed through the intravenous route. "As far as his central nerve system and brain functioning is concerned, Sai Baba is on continuous sedation, because he is connected to the ventilator, so it becomes difficult for us to assess his consciousness level accurately," the doctor said. A team of doctors at the Sri Sathya Sai Institute of Higher Medical Sciences are monitoring his health round the clock, Ravi Raj said. The 86-year-old Sai Baba was hospitalised on March 28 following problems related to heart and respiration. Earlier, State Major Industries Minister J Geetha Reddy told reporters that the Government held a coordiation meeting with hospital doctors, Sai Baba Trust members and the local district administration to make an assessment of Sai Baba's health. "The government is there to assist in every aspect on whatever suggestion the doctors give on the health condition of Sai Baba," the minister said. After conclusion of the coordination meeting, authorities said the trust members are likely to brief the media in the evening to clarify reports appearing in a section of the press about the succession to Sai Baba. Doctors attending on spiritual leader Sri Sathya Sai Baba at a hospital in this town in Andhra Pradesh today said that he continued to be in a "very critical" condition. A bulletin issued this morning by the Sri Sathya Sai Institute of Higher Medical Sciences (SSSIHMS) here said that Sai Baba continued "to be in the same critical condition as yesterday. He continues to be very critical." "He is still on ventilator support. A cycle of slow haemodialysis has been completed on him this morning. "He continues to be under close scrutiny and round the clock treatment by the panel of doctors attending upon him," the bulletin added. The hospital had said yesterday that the response shown by Sai Baba to the treatment continued to be minimal by all the vital organs. The 85-year-old Sai Baba was admitted to the hospital on March 28, following pneumonia and respiratory problems. With thousands of devotees thronging the town, the state police has tightened security and deployed additional forces here to maintain law and order. Prohibitory orders have been clamped in the town. PUTTAPARTHI: Satya Sai Baba’s health on Thursday turned “very critical” with his vital organs not responding to medical treatment. Director of Sri Satya Sai Institute of Higher Medical Sciences Dr AN Safaya, in a bulletin this evening, said Sai Baba’s episodes of low blood pressure were persistently indicating that the heart was weak. “The functions of various body organs are erratic and every attempt is being made to keep them in normal limits by administering appropriate drugs,” he said. The only positive aspect was a successful cycle of slow haemodialysis conducted during the past 12 hours to assist the kidneys. Safaya said vigorous efforts were on to revive his vital organs. Informed sources told Express that Baba’s brain was showing mild signs of activity though all the other organs had stopped functioning. “He is on life support system and the brain is showing very mild signs of activity,” the sources said. Earlier, Revenue Minister Raghuveera Reddy confirmed that Baba’s health was deteriorating and doctors were making last-ditch efforts to save him. Despite the best efforts, Baba’s vital organs were not responding to treatment, he added. He was speaking after an emergency meeting convened by CM Kiran Kumar Reddy. Chief secretary SV Prasad and DGP K Aravinda Rao attended the meeting. PUTTAPARTHI: Prohibitory orders were clamped here on Thursday as thousands of devotees started descending on the town following reports that the condition of Sathya Sai Baba has deteriorated. More than 2000 police officers and men have been deployed here, particularly at the Sathya Sai Institute of Higher Medical Sciences (SSIHMS) where the Baba is undergoing treatment. In Hyderabad, Director General of Police Aravinda Roa met Andhra Pradesh chief minister Kiran Reddy and briefed him about the security measures put in place. State major industries minister J Geeta Reddy, Anantapur district collector B Janardhana Reddy and deputy inspector general of Police Charu Sinha, who are camping here, reviewed the Baba's health condition this morning with SSIHMS director A N Safaya. They also reviewed the law and order situation and the measures being implemented for crowd control in any eventuality. Shops in the vicinity of SSIHMS have been shut down as a precautionary measure, a senior police officer said. Anantapur district Superintendent of Police Shahnawaz Qasim is personally monitoring the security arrangements. Meanwhile, members of the Sathya Sai Central Trust were closeted in a meeting here to discuss the trust's affairs in the wake of the Baba's deteriorating health. Principal secretary (finance) L V Subrahmanyam is also taking part in the meeting, sources said. Meanwhile, Safaya said in a latest statement that the Baba's condition remained critical. "Low blood pressure and the non-functioning of liver have become a major cause for concern.The Baba continues to be on ventilator support," he said.